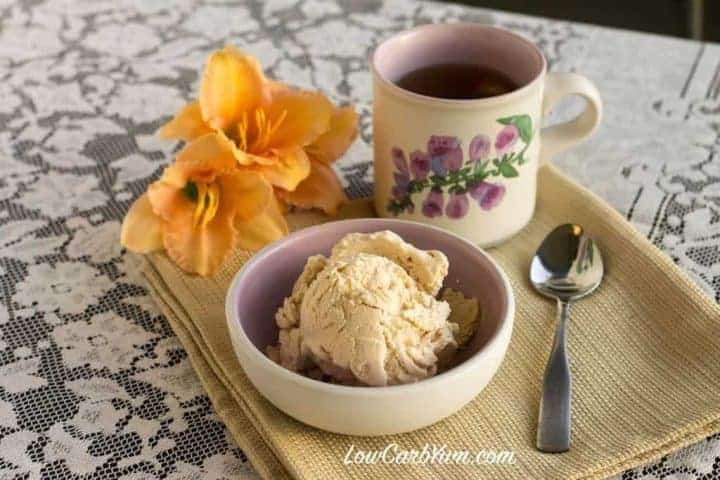 A low carb no egg peach ice cream recipe flavored with concentrated herbal tea. Enjoy the fresh juicy taste of peaches in a yummy cool sugar free treat. 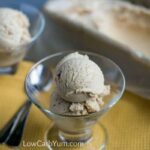 I’ve got another sugar free low carb ice cream flavor to share. I just can’t get enough of this frozen treat. And, it’s so easy to make. After making the green tea ice cream, I realized that there is endless flavors of ice that can be made with tea. The great thing about brewing tea is that the carbs are usually less than 1g carb per serving. 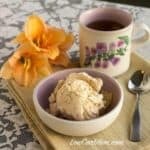 You will love this no egg peach ice cream recipe. 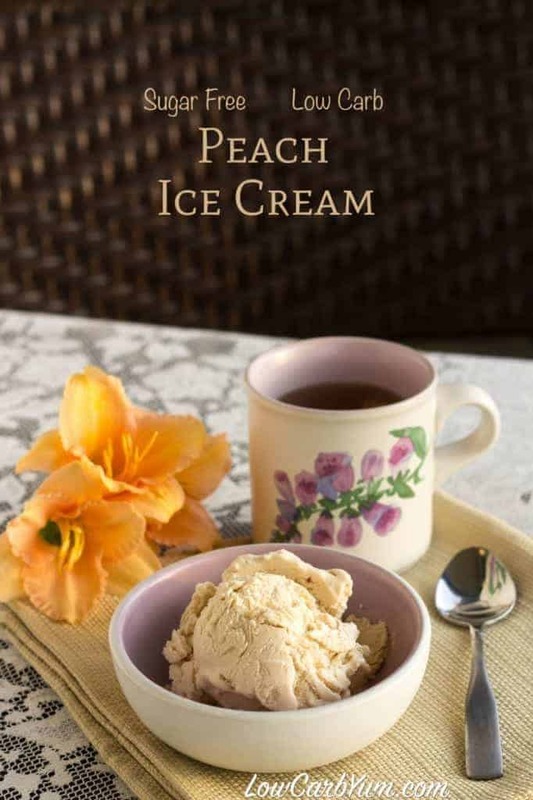 It is bursting with summertime peach flavor! We all know that peaches are typically loaded with natural fruit sugar that isn’t low carb friendly. 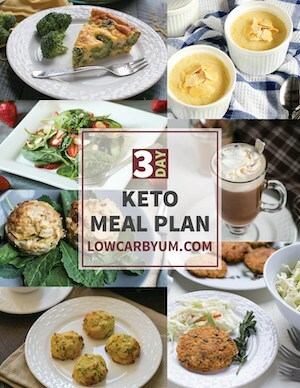 That’s why I used delicious low carb peach tea in this recipe so you get all that juicy peach flavor with none of the carbs! 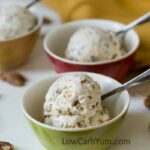 Wouldn’t it be wonderful if there were more options available to the low carb community when it comes to commercially prepared ice creams? Stopping in at a local seasonal ice cream place in our town used to be a summer tradition. We still go to the local ice cream shop, but I typically don’t get ice cream for myself. They do offer a few sugar free ice cream flavors, but it’s not made in house like the regular ice cream. Most sugar free ice cream sold has more carbs than I prefer or nasty ingredients which is why I refrain. The only way to be certain of what you are eating is if you make it yourself. 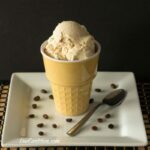 Although you don’t need an ice cream maker to make ice cream at home, I invested in a Cuisinart ICE-100 machine because it doesn’t require freezing the canister. 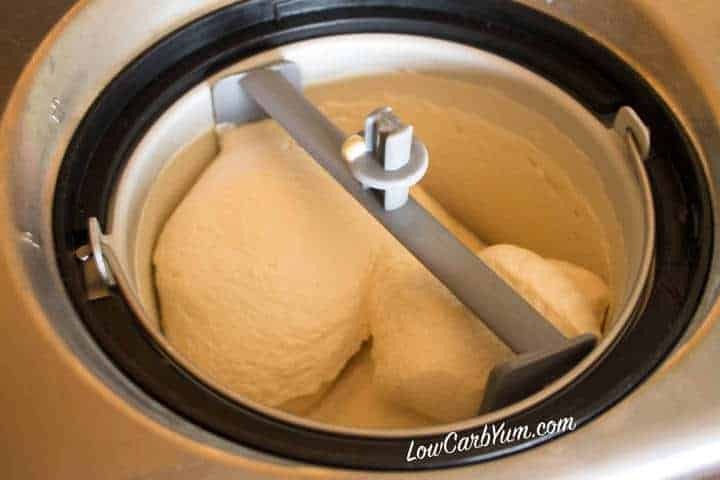 I make a lot of homemade low carb ice cream so the cost of the machine has paid for itself. 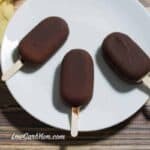 Comparable sugar free ice creams sold at natural food stores can be $6 or more for a pint. 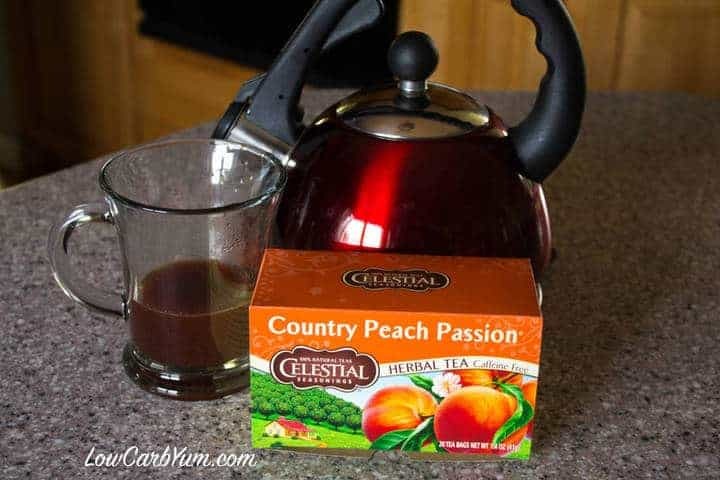 The carbs for the Celestial Seasonings Country Peach Passion herbal tea is listed as zero carbs per serving, but I believe there are some carbs in a serving. To be safe, I was conservative and added a few carbs into the count. 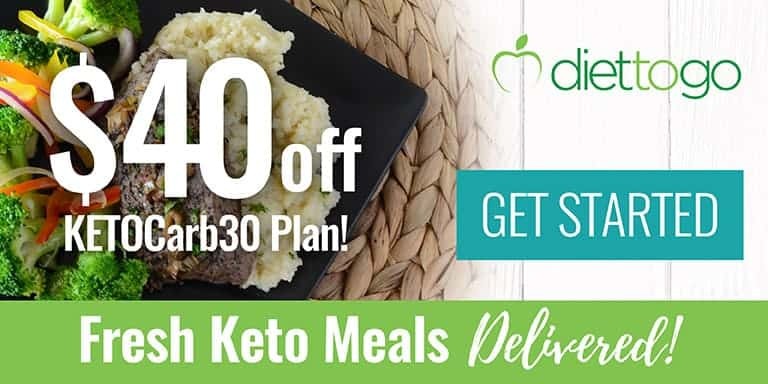 Do you have any experience with herbal fruit teas knocking you out of ketosis? If so, I’d be interested in hearing of your experience. 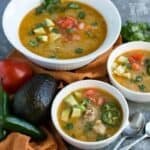 The only information I could find was on a low carb forum. I know that some folks are very sensitive to fruit so it is possible that infusing the dried peach in tea could have an effect. This does have a very strong peach flavor. Next time, I’ll stay away from any fruit teas that may impact glucose levels. 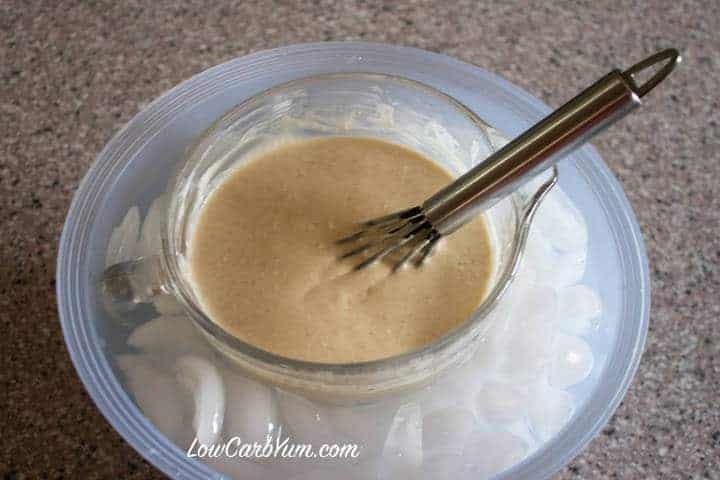 For me, though, this homemade sugar free ice cream is much healthier than any I can buy locally. 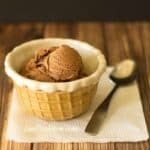 I’ve found that cooking the milk base results in a better ice cream texture. Most recipes don’t cook the base unless eggs are added. 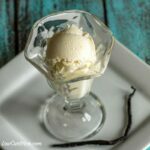 Adding a little bit of softened cream cheese to the warm base seems to give creamier ice cream. I also prefer adding a touch of xanthan gum as a stabilizer. 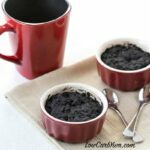 Feel free to use any flavored tea you like in this recipe. 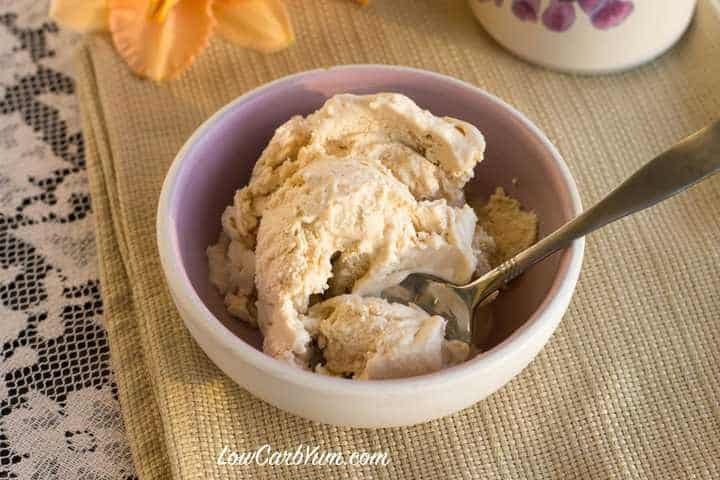 I miss fresh peaches so this low carb no egg peach ice cream was a nice way to satisfy my peach craving with very few carbs. Place tea bags and boiling water in a cup. Brew tea in boiling water. Squeeze tea from bags and discard. 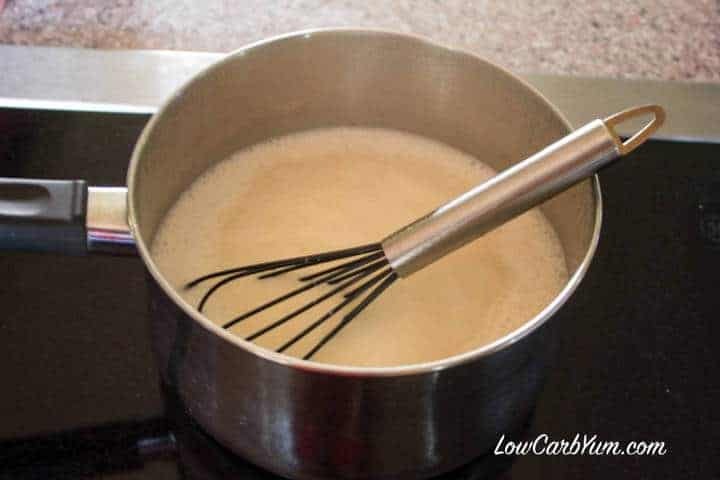 In medium saucepan, combine tea, sweetener, cream, and milk. Bring to boil, then reduce heat to simmer and cook for four minutes. Stir in cream cheese, xanthan gum and sea salt. Chill over water bath for about 20-30 minutes until cooled. 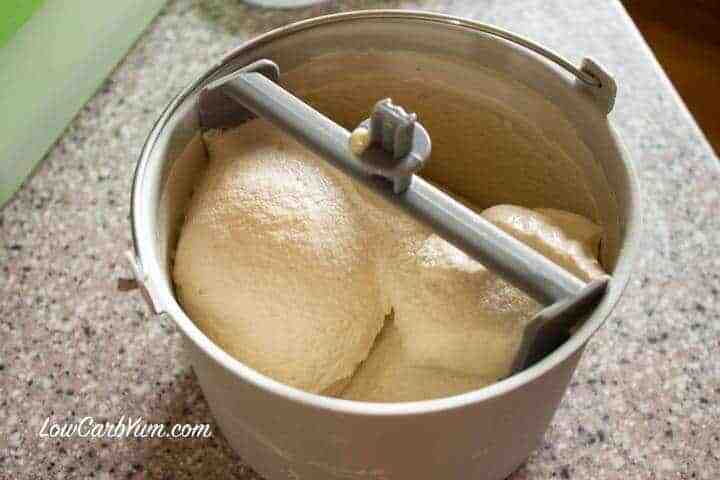 Pour into ice cream machine canister and process according to manufacturer's directions. Best served shortly after frozen. 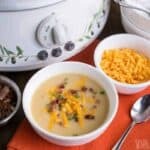 Leftovers can be stored in freezer, but will need to be thawed slightly before serving.